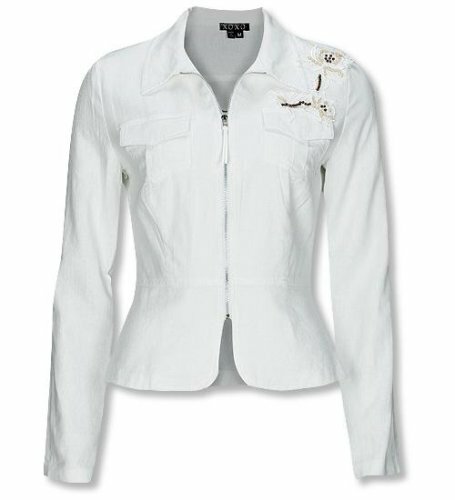 Slim three-button silhouette with front shaping darts. Notched lapel, four-button detail at cuff. Front welts pockets, single breast welt. A classic redefined...our elegant 3/4-length tweed coat, finished with notch collar, two gathered patch pockets; shaped with princess seams. Acrylic/wool/polyester. Lined. Hand wash. Imported. Shell: 49% polyester, 49% viscose, 2% spandex. Lining: 100% polyester. Black with grey pinstripes throughout. Approximately 25" from back of collar to hem. Notch collar. Three button front closure. Slightly padded shoulders. Outbreast welt top pocket. Two front flap pockets. Princess seams. Slim-fitting jacket, inspired by the heritage style of a mans cutaway riding jacket. Short point lapel, clean cuffs, swallow-tail back with pleats. Finished with an angled chest welt and four covered buttons at front. 33 ½ from center back. Fully lined. Wool. Dry clean. Made in U.S.A.
Short, classic-fitting jacket with shaping seams for a tailored silhouette. Notched collar, patch pockets at waist and chest. Mother-of-pearl buttons along front and cuff detail. Fully lined. 22½ from center back (23 woman). Linen. Lining: acetate. Dry clean. Imported. Slim denim jean jacket, heavily washed and abraded for a cool, distressed look. Straight collar, yoked back and front, single button cuffs. Vertical welt pockets at hip, front flap-patch pockets, adjustable waist tabs. Finished with signature metal shanks. 20½ from center back. Cotton. Machine washable. Imported.